The task management functionality available in SharePoint 2013 has many new and improved features. 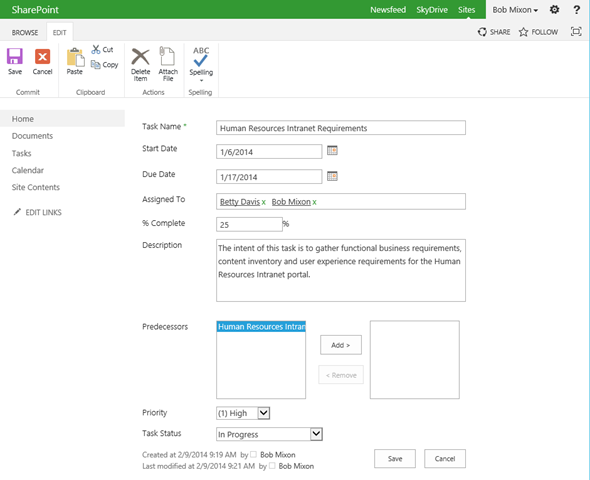 Features such as the ability to create sub-tasks, a new timeline view, more robust management of tasks using Microsoft Project 2013 and so on. In this article I will take a deeper look in to these new and enhanced features of SharePoint 2013 Task Management. For the purposes of this topic, I have created an “out-of-box” site using the Project Site template. No customizations have been made to the site, libraries or lists. The figure below is our demonstration site, using the standard Project Site template. The figure below shows the standard Tasks list that is included with the Project Site template. The list itself is very similar to what we found in earlier versions of SharePoint. However, you will notice a timeline view is now available. More about the timeline view later. An improvement in SharePoint 2013 task management is the ability to assign multiple resources to a task. In previous versions, you could only assign a single resource which made using the “out-of-box” task management cumbersome when managing more complex projects. You now have the ability to create subtasks which is another new feature found in SharePoint 2013. I believe this was primarily implemented to support Microsoft Project integration. More on Microsoft Project integration below. To create a subtask, click the parent item context menu and select the Create Subtask option. The figure below shows our task list after adding 2 subtasks. The timeline view provides you with the ability to display specified tasks in a timeline, or Gantt, style view. 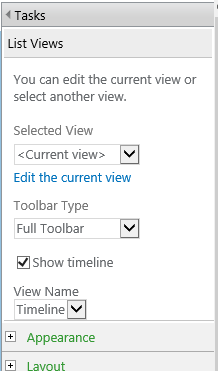 The timeline view can be enabled or disabled for any task list in SharePoint. This is accomplished by editing the web part properties and checking/unchecking the Show timeline option. You can add and remove tasks from a timeline by clicking the task item context menu and selecting Add to Timeline or Remove from Timeline option. In the figure below, you can see that I have added the Human Resources Intranet Requirements task to the timeline. You will find the timeline view is best suited to display high-level tasks and milestones. If you add too many tasks it will become cluttered and difficult to read. One of the best new features available in SharePoint 2013 is the aggregation of tasks, assigned to you, in your personal site. This provides you with a view of all tasks, across the entire farm, aggregated in one place. This means, regardless of where a task resides (a department site, project site, team site, etc.) they will all be aggregated to your personal site. To accomplish this in the past, we had to customize a solution using search web parts, create a custom developed solution or purchase a 3rd party tool. Note: The personal site task aggregation feature utilizes the SharePoint FAST search engine to index task information and make it available for querying. This means, tasks will not be aggregated to your personal site until the search indexer has processed the tasks. To see an aggregate view of all your assigned tasks, simply go to your personal site and click the Tasks link in the left vertical navigation area. In the figure below, you can see the tasks assigned to myself. You might have also noticed, when you click a task item context menu, you have the ability to edit the task and go directly to the containing site or list. The is very convenient for managing tasks that reside in many locations of your Intranet. 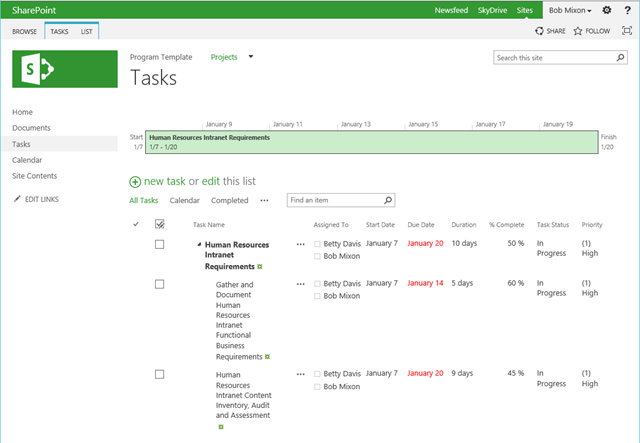 Microsoft has made the management of SharePoint tasks, in Microsoft Project very convenient. To open a task list in Microsoft Project, simply navigate to the task list and click the Open with Project option on the ribbon bar. 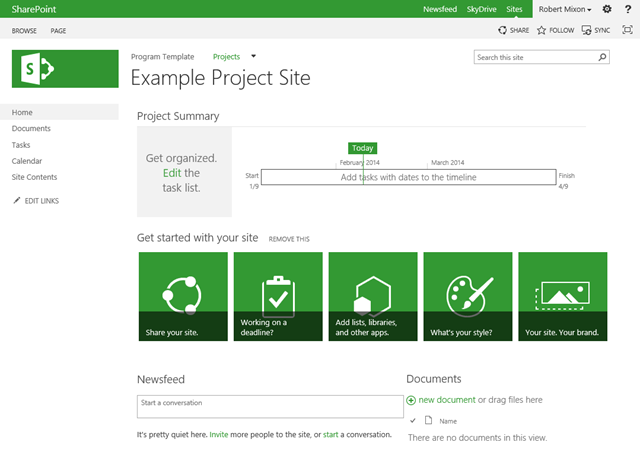 Now that your SharePoint task list is open in Microsoft Project, you can use all of the features available in Microsoft Project. After you make updates, in Microsoft Project, and save them, all of those updates are posted to the SharePoint task list. Note: You may be asking yourself, Microsoft Project has many more features and fields then a SharePoint task list; is this information lost when you close Microsoft Project? The answer is no! Microsoft Project and SharePoint are tightly integrated and the actual project file is also saved to the site; in the Site Assets library. There may be situations when you wish to publish additional information from Microsoft Project to your task list in SharePoint. This can be easily accomplished by mapping fields using the following steps. For the purposes of our demonstration, I will map the Duration field from Microsoft Project to our task list in SharePoint. In Microsoft Project, click the File tab in the ribbon bar. In the Info section, click the Map Fields button. In the Map Fields dialog, click the Add Field button. In the Add Field dialog, for the Existing Project Field, select Duration from the drop-down list. For the New SharePoint Column, leave the default as Duration. Click the OK button when you have completed these steps. Click the OK button in the Map Fields dialog when you have mapped all the desired fields. Now the Duration field in Microsoft Project is mapped to a new Duration field in the SharePoint task list. Save your project and the SharePoint task fields will be updated, containing the mapped field values. As you can see in the figure below, the Duration field now contains the duration information from Microsoft Project. Once you start editing and managing your project tasks in Microsoft Project, I have learned that it is easier to continue using Microsoft Project; instead of switching from editing tasks in SharePoint some of the time and in Microsoft Project other times. As you can see there are many new and improved task management features found in SharePoint 2013. The ability to assign more than one resource to a task and the timeline view are of my personal favorites. In addition, I use the Microsoft Project integration on virtually all project management scenarios I am involved with. It is important to note; all of the features described in this article are available in Office 365. I use Office 365 to run my business and manage all client projects and these task management features and Office integration I use on a daily basis. If you are interested in discussing these features, obtaining a demonstration of how they may improve your task management needs in your environment, please Contact Me. If you have any questions or comments, please leave a comment below; I will answer as I have availability. Bob – appreciate the post, very informative. Have been playing around with this capability as well and had a couple questions that you may have experience with. 1) when the task list is opened using MS Project, is there an offline version saved by default that can be later reference for offline editing? This is helpful for when network connectivity is not available. 2) try to create task list view that shows open tasks that are due within a certain timeframe. See where you can reference a specific date or [TODAY] in the date drop down, but curious if this can be a prompt like available when creating view in MS Project? Unfortunately, there isn’t an off-line copy of the MS project file stored anywhere locally. I’m sure it’s cached somewhere but that really wouldn’t work. I haven’t looked in to using Skydrive to synchronize the site assets library. This might be an option. Another option would be to use Colligo’s product. You could synchronize the site assets library and take an offline copy. One thing to remember. Simply updating the project file, offline, won’t update the SharePoint task list. Once you updated the MS Project file, in the site assets library, you would need to open it and update the task list. As for #2, I’m not certain I completely understand the question. You wish to have a date span view in MS Project or SharePoint? Both of these can be accomplished. If you wish to do it in MS Project, you can create a report. I changes SharePoint online task content type to date and time so we now can assign task of 1 hour insted of 1 day. All works fine (without Project Server) but now in need to synchronize this to Outlook. In Outlook the tasks are still in days (only a date). We need them in date and time. A task of 1 hour becoms 1 day. Thanks for the excellent description for each part of SP 2013 Tasks List..
Kindly your inputs will be appreciated. I create a view: Imminent Task to show Task which Due Date is greater than [Today]. By default, it display both Summary Task and Subtask. How can i hide Summary Task, i mean only the bottom-level Task display. Unfortunately, using the standard view, there isn’t a way to determine if the task item is a summary task or not. One option would be to add a column (Is Summary) and filter on it. But this would require users to check that flag when the task is a summary task. The other option would be to not use the out-of-box list view, use something like jqGrid and display everything you want with jscript. It would then be a matter of filtering/displaying the tasks as you deem appropriate. I’m non-technical, so i choose the fist option: add a column Is Summary (Choice type: Yes, No). Anh when i filter on: Is Summary = “Yes”, it’ display right. But when filter on: Is Summary = “No”, it still display the Summary Task. Is something wrong with the way i work? Thanks for the post. I wonder if it’s possible to remove the summary or level of effort tasks off calendar in SharePoint 2013? Thanks. This is a very common requirement. I would recommend creating a simple workflow that is run each time a task is added or modified. This workflow would update the items permissions. The workflow can be created with SharePoint Designer and will need to be a SharePoint 2010 workflow. I love your article. My question is can one have a single instance task list visually represented in two sub sites? i.e. I have created a task in sub site 1, and I want that task to show up in sub site 2. In general, the answer is yes. There are a number of way of accomplishing this. You could export the web part then import it on the other site or use the content query web part. I am wondring why Microsoft still ignoring all the users feedback about not allow create subtask in filltered view ? Hi Bob, thanks for the helpful information! I’m wondering if the Tasks you set up can be linked to your SharePoint calendar. My team has found that we need to create alerts for our calendar entries, but they need to be 2 months ahead of the due date and SharePoint/Outlook only allow you to create a reminder 2 weeks ahead. So I was thinking of using the Tasks app, and creating entries that duplicate the calendar entries, so that we can set up reminders 2 months ahead of time. Is that possible??? Is there a way to easily create repeating tasks (like daily, weekly, monthly yearly etc)? I’ve found posts where you can make workflows but it seems like a very tedious and time consuming for an advanced user. I’d like to have something for the less apt to be able to use. Any ideas would be very helpful. Thanks and I’m definitely going to use your Aggregating your Tasks to your Personal site, that’s fantastic. Do you know why it is set that only those with design (or manage list) are able to add tasks to the timeline? Also, I cannot seem to get tasks aggregated to my mysite. The only tasks that show are those I add directly to the tasks list within mysite. Any ideas what to check? Is your implementation on premise or Office 365? Thanks for the detailed explanation Bob. I have a question. How do you restrict to an assignee to change the due date of an assigned task? They will be able to perform any changes like add notes, update the progress but the due date is just controlled by the PM or someone you specify. You can use InfoPath to create two item edit views. You can then create two form load rules and load the specific view based on who is currently logged in. The first view would be for any team member and the second view would be for PM’s. Sorry if this is a daft question but how do you complete a project or mark it as finished? Should this just be deleted or is there a way for the project to me marked as complete and removed from the project list and moved to some sort of archived page? We have a list of on-going projects and this is now filling up with abandoned or finished projects, making the page cluttered. Do I just have to delete these project pages when I am done? You can use site expiration, which will delete the site. There are policies you can configure to do this. 1. Moving all site content to a records center then deleting the site. 2. Backing up the site then deleting it.